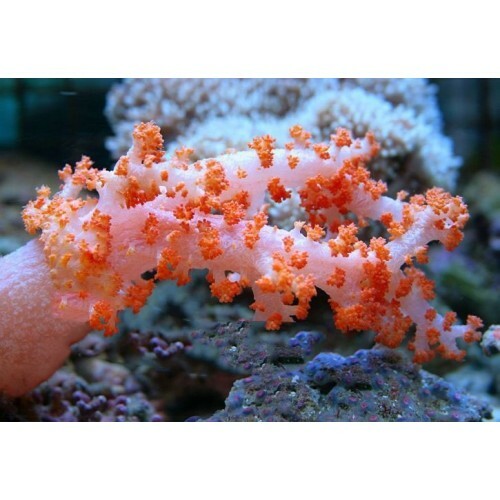 The Carnation Tree Coral or Dendronephthya Carnation is one of the most beautiful and peaceful corals, and is also known as the Cauliflower Soft Coral, or Strawberry Soft Coral. There are over 250 different identified Dendronephthya species. It is found in a variety of flamboyant colors with red or orange being the most common. It is normally shipped while attached to a small piece of live rock or coral rubble. It is extremely difficult to maintain in the reef aquarium, and should be housed in an established reef aquarium, by the more advanced marine aquarist. It requires low lighting combined with medium to strong water movement. It is necessary to have a constant current with an abundance of algal plankton. For continued good health, it will also require the addition of strontium, iodine, and other trace elements to the water. It does not contain the symbiotic algae zooxanthellae. Therefore, its diet should include live, baby brine shrimp, micro-plankton, and other small foods designed for filter feeding invertebrates, in order to survive in the reef aquarium. These foods must be available almost constantly. Again, only expert aquarists should attempt to keep this coral.